Three years ago the Daniel Gervais Trio performed here and anyone at that concert will be rushing back for more. High spirits and fun are guaranteed when the trio hits the Venables Theatre stage Friday, December 4th, at 7:30 pm. Daniel is Canada’s Grand Master Fiddle Champion and he is joined by guitarist Clinton Pelletier and Keith Rempel on Bass for a eclectic and entertaining mix of jazz, classical, bluegrass, country, old time, ragtime and Celtic music. Three years ago they had the South Okanagan Concert Society audience on their feet clamoring for more. Full command of the music combined with spontaniety and high energy appeals to all ages and musical tastes. Daniel is also a master at engaging everyone prior to each piece with fascinating bits of history of the genres and styles. Flex tickets are on sale at Beyond Bliss in Oliver, Imperial Office Pro in Osoyoos and at the door. The four admission pass is entirely flexible and admissions can be used together or in any combination. Single admissions are $20 and those 17 and under are welcome to attend concerts free. The venue is wheelchair accessible and those in the Oliver/Osoyoos area requiring transportation can call Maureen at 250 495 7978. Daniel’s ability as a classical violinist was broadly recognized in 2002 when he attained the highest mark in Canada from the Royal Conservatory for his Gr. 8 Strings exam. A little older now, he has a Masters degree in Music and an active portfolio of performance, recording and teaching. His talents are not one dimensional. 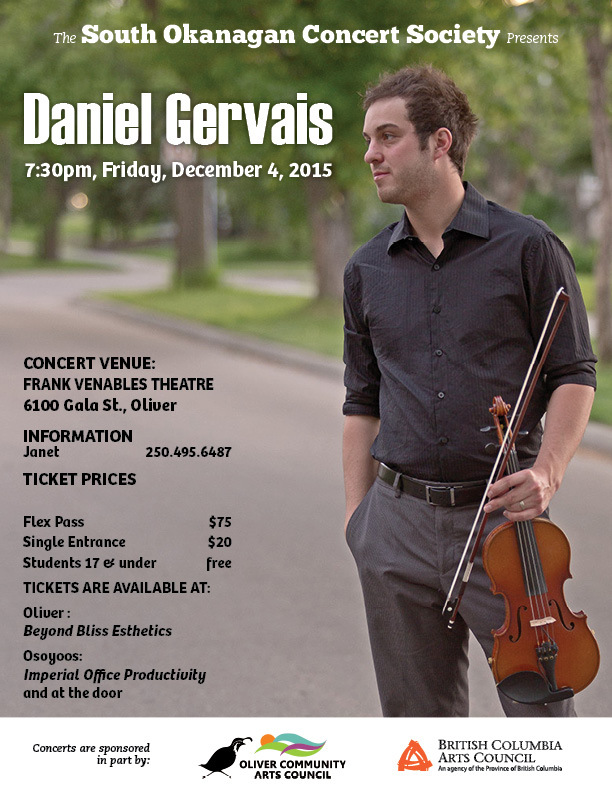 He moves from traditional fiddle music to classical violin and to entertaining, story telling and composing. He has toured North America and France. Clint Pelletier (pictured left) is and outstanding free lance guitarist not content with just playing chords in the background. 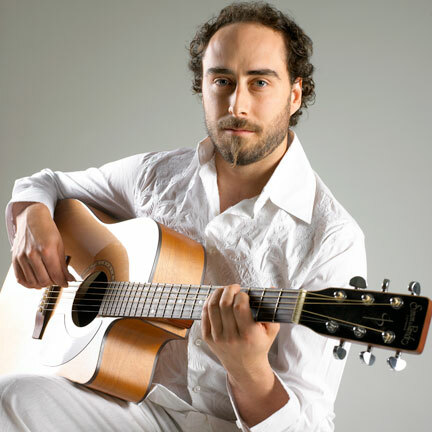 He has the skills to put the guitar on an even footing with the violin and together with Daniel their Gypsy Jazz explorations are reminisent of Belgian guitar virtuoso, Django Rheinhardt and French violinist Stephane Grappelli. Clint has initiated several bands, released many recordings, and is tracing his French Canadian roots through stories and music. Perhaps the most amazing musician in the trio is Keith Rempel, a professional electric and upright bassist, currently residing in Edmonton. Blind since birth, Keith has never seen the notes on a sheet of music. He is a graduate from the Grant MacEwan College of Music and is known for his perfect pitch and talent with vocal harmonies. He says, “In one way, blindness can be an advantage because I have to pick things up by hearing it and then memorize it. When you know something from memory, you perform a lot better.” Indeed. This is exactly what he does! Chase the winter blues and come out Friday, Dec. 4th, for an evening of lively upbeat music. 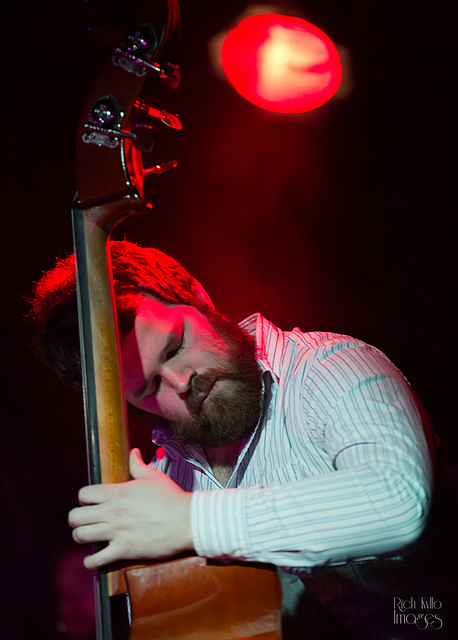 The Daniel Gervais Trio, devoted to excellence, loves what they do best. It shows and the feeling is contagious!